Steve G. Jones, Ed.D., Clinical Hypnotherapist, charges $1,500 for a custom recording and $25,000 for a one-hour private hypnotherapy session at his office. But you can get all the benefits for this low price. Simply listen to the Relieve Shame Hypnosis MP3 every night as you go to bed for three weeks and feel the changes happening in your life. You will feel more empowered, more in touch with your true self, and you will truly know that your goals are within your reach. Steve G. Jones achieves AMAZING and LASTING results!!! Hypnosis is the easiest way to affect change in your life because the positive messages go straight to your subconscious mind effortlessly so you can accomplish your goals and reach for the stars!! All you have to do is listen to the Relieve Shame Hypnosis MP3 download at night as you go to sleep!!! You’ll hear soft music, the gentle sounds of the beach, and the soothing sound of Steve G. Jones’ voice all working together to bring about positive changes in your life easily and naturally. Steve G. Jones has been helping people improve their lives with hypnosis for over 17 years…now it’s time for him to help YOU… don’t wait, do it NOW !!! you’ll be glad you did. See you at the top! And as you continue relaxing deeper and deeper and more deeply relaxed, you realize just how powerful you are. You realize that you have the power within you to overcome shame and so you realize that it is okay to be who you are. And in order to realize this more fully, you must have and absorb deeply many separate moments of being accepted, loved and valued. So you look for these opportunities, these moments and when they happen, sometimes all by themselves, you absorb them deeply. Make them part of you and you stop relying on anyone who treats you as if you are not okay. You spend more and more of your time with the people who know you are okay the way you are. And you let them know more and more about you. You choose your relationships based on how you are treated, not just on whether the other person feels comfortable with you. Because we can be comfortable with what we are used to even if it is bad for us, but rather with people who treat you properly, with people who know you are okay and who treat you that way. Therefore you treat people the way you want to be treated. When people treat you poorly, tell them to stop it. If they keep it up, don’t tell them over and over because that’s like begging. That would make you feel weaker in their presence; instead you need to feel strong when you have to be around such people. So you tell them to stop it. You hold people responsible for how they treat you. You hold yourself responsible for how much time you spend with those people who treat you poorly, how you respond to their mistreatment is something else you hold yourself responsible for and you hold yourself responsible for whether you take their opinions seriously. When people imply that you aren’t valuable, they are wrong. You must learn how to throw away such comments immediately. You know how angry you get when you are treated this way. The anger is a guide that tells you that this persons opinion of you is worthless and clean be thrown away without question. Understand that only a few people are likely to treat you poorly. The rest of us are ready to treat you well. If you catch yourself thinking otherwise at least remind yourself that you are a positive person and those people who treat you poorly are lying. When people treat you well, absorb it. Always take a few seconds to feel the good feelings you get when you are treated well. Let your appreciation show, a natural smile will do just fine. Showing your appreciation reinforces the other person and encourages them to stay around you longer. Don’t talk yourself out of it. Most compliments are honest. Even when someone is trying to manipulate you they say things they mean. Turn down the manipulation but accept the compliment. For example, thanks for noticing how attractive I am, but I still don’t want to give you my phone number and thanks for noticing I have good taste in cars, but I still won’t pay what you are asking for this one. Those are just examples of ways to accept the compliment yet avoid the manipulation. The most important factor in overcoming shame is how you treat yourself in your day to day activities, in your day to day thinking. When you have been treated poorly, how do you treat yourself afterwards, the old unhealthy option is to focus on yourself and wonder if they were right about the bad things they said. Your new healthy option which you now choose is to focus on your anger and mistreatment. When you’ve been treated well, how do you treat yourself afterwards? Do you relax and think about the good things? Do you mentally recycle the best parts? Do you notice how much you agree about your good qualities? Do you take the time to enjoy the good feelings? The answer to all of those questions is yes. You do relax and think about the good things about yourself. You do mentally recycle the best parts about what they said. You do notice how much you agree with the good qualities they have uncovered about you. You do take time to enjoy the good feelings you get from hearing good things about you. And in doing all of these things you are enjoying the changes you are making in yourself. Your attitude about yourself improves as you gradually let go of shame using the practical advice I am giving you. Day by day you accept yourself more and more. I am very proud of you for making this commitment to yourself. You are obviously a wonderful person; deserving of all of the good thing life has to offer. Accept this compliment and all of the others which will soon be coming your way. Relax and realize that everything is going to be just fine. Many people feel shame for various reasons, but realize that if you do feel shame, there is a way to overcome this strong emotion. 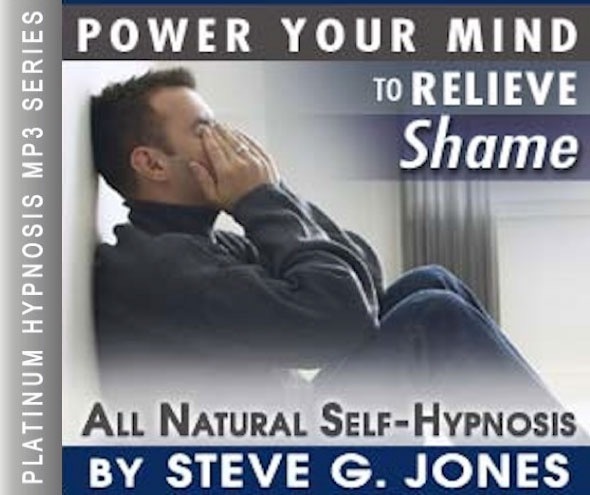 The Relieve Shame Hypnosis MP3 audio can help you overcome shame. You should not have to go through your life, constantly feeling a sense of shame. This powerful Relieve Shame Hypnosis MP3 session will allow you to deal with whatever in your life brought upon the feeling of shame, in a safe and natural way so that you can move on with your life and live without shame. You deserve to be happy and free and most importantly, free of shame. We suggest you listen to this recording for 21 nights in a row before going to bed. The powerful suggestions on this hypnosis session will help you overcome shame. There are so many great qualities about yourself, and hypnotherapy will help you see these positive aspects. 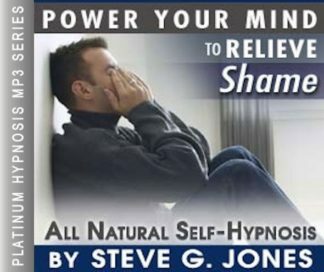 You can overcome shame with hypnotherapy!